In today's society Americans are growing increasingly obese, while the pressure to fit into a perfect body "mold" increases. What has resulted has been nothing short of a disaster where poeple are spending billions on diets that lead to disappointing results. But more often than not, people don't realize that buidling lean muscle boosts your metabolism while providing numerous health benefits and fighting the obsesity epidemic. 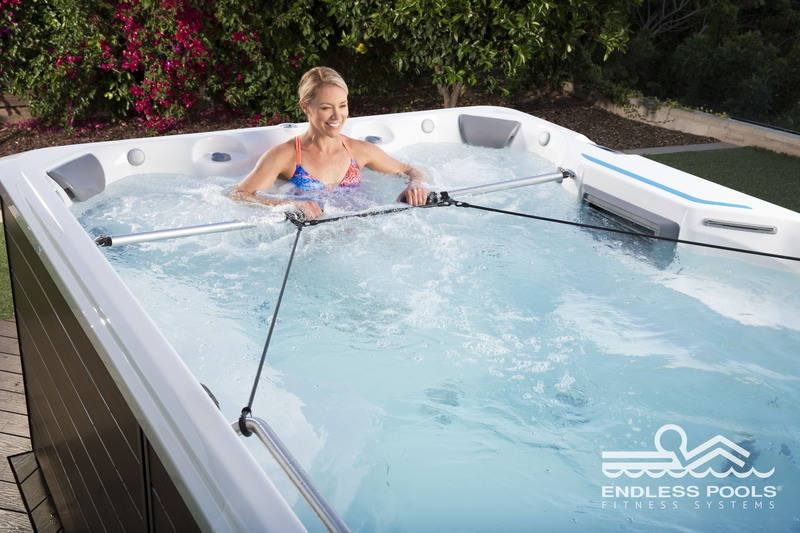 At IHT, we are proud to offer you Endless Pools Fitness Systems, which are swim spas that offer numerous options for buildling muscle tone in the privacy and comfort of your home, 24-7-365. Read on about muscle tone! Endless Pools swim spas offer numerous health benefits, most notably improved muscular tone and flexibility. When we use our swim spa regularly, our muscles lengthen, becoming more flexible. And the repetition of performing swim strokes builds endurance, while the resistance of the water strengthens/tones muscles. Other activities may only offer benefits to parts of the human body: rowing for strength/endurance, running for cardiovascular fitness, weight training for strength, and yoga/pilates for core strength. Swimming engages your full body in every single workout! In the swim spa, our lower bodies push our upper body through the water. The freestyle stroke engages your glute muscles while the breaststroke works your inner thighs and hamstrings. And, the backstroke works on your hip flexors, quadriceps and glutes. The swim spa engages your core as well (including your hips, lower back, and abs). The lower back and abs balance your strokes. As your body twists side-to-side, the core controls your movements. Your hips assist in kicking while propelling you through the water, catching the up-and-down movement of your legs. Your core muscles provide increased stability in everyday tasks as a result of swimming. Every stroke engages your biceps, triceps, chest, shoulders and upper back as well. During the upstroke, your arms must reach forward and pull your body weight through the water on the down stroke. The push-and-pull motion uses your chest and arms. The rotation of the arms forward in the breaststroke and backward in the backstroke uses your shoulders and upper back to further tone your upper body. The benefits of muscle tone include greater muscular strength, increased muscle mass/density, and improved endurance. Swimming is a full-body muscular workout, paving the way for a firm and well-sculpted physique. Swimming and building muscle mass will increase your basal metabolic rate, burning more calories per day and aiding in weight loss. A more toned physique leads to stronger bones, decreasing the risk of osteoporosis. Daily tasks become easier while aches and pains fade away. Your resting heart rate improves, and your risk of Type 2 diabetes and cancer decreases. Muscle toning increases your HDL cholesterol levels (good cholesterol). The immune system improves, as well as mental health, posture, and balance. We all dream of having that perfect build...but doing is better than dreaming. Jump in and make a splash while developing lean muscle mass and shedding body fat.